Thanks for viewing our online catalog! This is a partial list of products available, but we add new products each month. Products listed here are for viewing only as we do not accept online orders at this time. 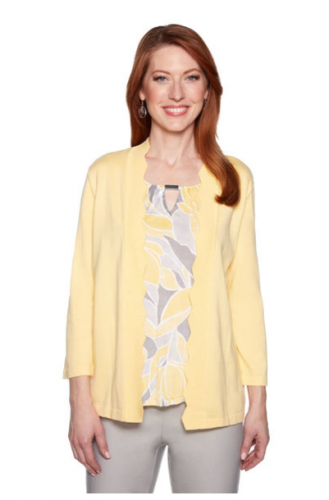 There's nothing mellow about our yellow two for one sweater! Our three quarter sleeve two for one sweater has a floral printed silky knit inner and a silver accent highlighting the notch neck. Inner blouse is non-detachable. © 2019 Wards Apparel. All rights reserved.